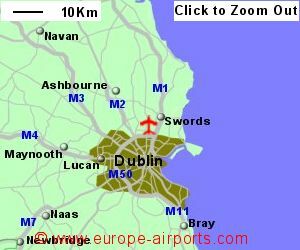 Dublin Airport is located 10Km North of Dublin, close to the M1 and M50 motorways, on the east coast of Ireland. The M1 motorway runs less than 2 Km west of Dublin airport and the M50, which loops around Dublin city and connects with other motorways, is 2 Km to the south. Dublin airport had just one terminal until Terminal 2 was opened in late 2010. There is regular bus service into Dublin city and taxis are available. 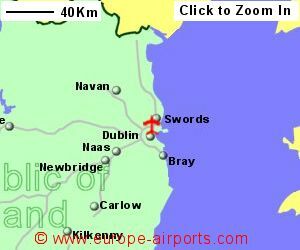 Dublin airport does not have its own rail service, the nearest stations being in Dublin city. Between the two terminals, Dublin airport has 36 bars/cafes/restaurants, a large number of shops, a bank, 7 currency exchange facilities, ATMs, business lounge, VIP lounge, and WiFi Internet access is available. 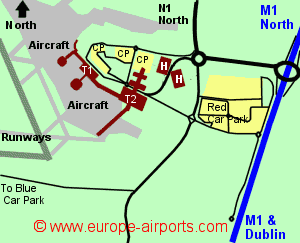 The Madron Hotel and Radisson Hotel are located close to the Terminal buildings. Dublin airport has Airport Carbon Accreditation, at the Reduction level. Dublin airport, the busiest in Ireland, handled 29.5 million passengers in 2017, an increase of 6% from the previous year.